I may have just made things worse. I’ll readily admit that I’m not the smartest person in the world, but I know that acting in anger only leads to more anger, retaliation, and the next thing you know the Navy SEALs are sent in, when the whole situation could have been avoided with simple words. After giving myself a day and a half to rage about the lolcat, (also, here) I came up with several revenge plans–which are much funner to plan than to enact, especially if you’ve got enough foresight to envision the consequences–then made a decision as to what I should do. And, when I’m trying to smooth things over, what I do usually involves baking. Please accept this homemade whole wheat bread, and my apologies. I feel like there is an animosity between us that, as neighbors, we can ill afford. I am sorry that my dogs are noisy at times, but I want to make my position known. I have spent most of my life battling severe emotional disorders—I was diagnosed with major depressive disorder at the age of ten, and my depression often manifests itself in the form of anxiety. I have spent a lifetime talking to therapists and trying to find the right combination of drugs that would get me, if not to normal, than at least to functional. Over the years I’ve learned that acting in the heat of emotion never results in the outcome desired, so I’ve allowed myself a couple of days to calm down, and collect my thoughts and feelings. I wish I was a brave enough person to explain all this in person, but I am not. I share this with you not as an excuse, but as an explanation of how important Max and Lulu are. It’s been three years since they’ve come to live with me. In that time, I’ve been able to completely cease both psychotherapy and drug treatment—and it’s because of my dogs. On my very worst days, the days when I don’t want to get out of bed, I still have to, because Max and Lulu need me. They calm me down when I’m anxious. They cheer me up when I’m sad. They have quite literally saved my life—when I lost my job last year, I was suicidal, but I couldn’t abandon my dogs. The simple fact that before I could do anything to harm myself, I needed to provide for their care and welfare prevented me from doing anything rash. Max and Lulu were adults when I acquired them. Their previous owners had done an excellent job with most of their training, but socialization was lacking. However, as the previous owners live on a side street in a quiet, rural town the fact that they would bark at passing vehicles or pedestrians wasn’t as big of a deal. When they came to live with me three years ago, everything seen and heard outside the windows would set them off. Passing vehicles, people on foot, the roosters in the pen to the east, the trains, the birds…everything. I spent a lot of time teaching them to be apartment dogs, and have gotten them to the point where they only bark when they see, smell or hear another dog, when people are talking loudly outside, or when Lulu wants someone to come pay attention to her. And yes, I realize that that seems like a long list, but consider how much noisier they would be if they barked at every car that drove by, or every person going to check their mail. I have tried to be a good neighbor when it came to Max and Lulu, and I honestly thought I was succeeding until a couple of weeks ago. I realize that living in a condo complex like Lakeridge comes with challenges, like hearing the neighbors dog’s bark, or crying babies, or loud music, for instance. I assumed that everybody else did too. I’m not really sure how to proceed at this point. On one hand, I’m angry at the idea of having to run the air conditioner when it’s in the 60s outside, because if I leave the glass door or windows open the dogs might bark and be annoying—I’m still looking for a job, and am on a very fixed income, and I don’t want to pay a cent more in utilities than I have to—but on the other hand, I don’t want you to be angry at me, or my dogs. Likewise, keeping them contained isn’t an option. I know you didn’t believe me when I tried to explain this on Sunday, but being confined to the crate doesn’t stop the barking, rather, it intensifies it, and adds digging, growling and howling. The crate lives in my bedroom—directly above your bedroom. If the dogs are keeping you up at night, (and if they are, why don’t you tell me that, rather than the vague “annoying”?) restricting them to the crate would only make things worse. Furthermore, I don’t feel good about restricting their access to water at any time, especially as the weather warms up. You said that it’s not that hard. I say it’s not that easy. Max and Lulu are my world, but I know to you they are only yappy little dogs. Imagine if someone was leaving vulgar notes on your door complaining about your sweet baby, and perhaps you can understand why this has upset me so much Please know that we are trying, and we are getting better. In the mean time, please be patent with us. I tried to be gentle. I tried to show understanding and compassion, and above all, I used vowels. I also signed my name. I don’t know what’s going to happen next. I hope that we can put this whole business behind us. I’m afraid that it won’t be that easy, though. edit:The neighbor that I thought was the lolcat came to return the bread. She’s not the one who left the note. On the plus side, I have a new friend, and an ally in this whole issue. On the downside, I’m horribly embarrassed, and have no idea who the Lolcat actually is. So… now, I don’t know what to do. I was getting ready to write a post yesterday, when my computer died. I’m grateful that my sister married a computer engineer–even if he was camping, and therefore unavailable at the time. I managed to get a hold of Sis and the B-I-L, and B-I-L agreed to take a look at my computer, agreeing with me that it was probably the power cord. But not tonight–they were on their way to a play that the B-I-L’s sister is in. And so, I was preparing myself to face a weekend sans computer. Again. But, I started thinking, and remembered that I had a surge-protector that I could attach to the power cord, and it would light up if it was getting power. So I did that. It spat and flickered, but eventually, lit up, and my computer then told me it was plugged in, and therefor usable. All I had to do, apparently, was threaten it with the B-I-L.
With all this drama I don’t remember what I was going to write about yesterday. But it was going to be good. Really. This morning, I loaded the dogs into the car, and took them to the vet’s office to get shot. Er, I mean, to get their vaccinations–rabies and distemper and whatnot. Apparently, they haven’t been to the vet enough. Max was anxious, but it was more being in a strange place, surrounded by strange people and animals, including the cat next to us with an abscess that even I could smell. Lulu was having fun making friends with the other people, dogs, and yes, even the abscessed cat. She would have gone exploring back where the exam rooms are if she wasn’t on leash. I asked the vet-tech who gave the shots about Lulu’s ear, and told her what I was doing for it. She said what I was doing was good, but told me something better to do. Which means, when the dogs get their hair cut on Thursday, then Lulu’s going to be shaved. To like an eighth of an inch all over, so I can get to her ear better. 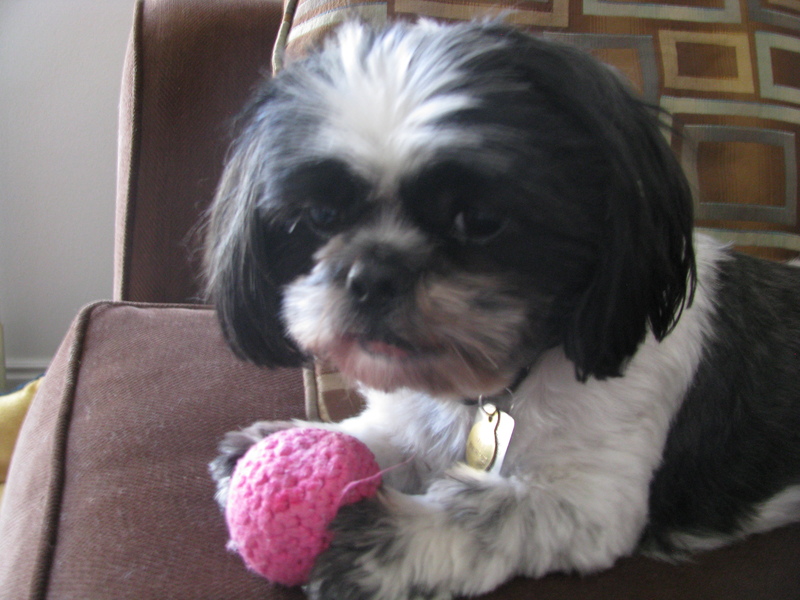 Lulu’s been shaved before, and, I have to say, a bald shih tzu is not a beautiful shih tzu. Pictures will follow. I promise. My new roommate has started to move in, and I have mixed feelings about it. I like her, I really do–but I’m not really excited about having a roommate, extra income aside. But, she’s outgoing, and talkative, and has engaged me in more conversation in the past two days than I’ve had in a week. She’s going to be good for me. And, if the cute boys who’ve been helping her move keep coming around, then all more the better, right? The good news is, what with being without a computer, and hiding in my room to stay out of the way while the roommate moves in, I’ve gotten a lot of reading done. I’m not caught up, by any means, but it’s a good start. I always forget how much I love reading until I lose myself in a good book. Yesterday, we worked to the point of a) exhaustion and b) where we didn’t know what to do next. The trailer is–well, it’s hard to say. I form a different opinion of how bad things are every time I go in. All I know is that Dad wants the B-I-L’s opinion before deciding how next to proceed. After spending all day yesterday on the phone, trying to describe to various salespeople what parts we needed, Dad and I went on a shopping trip to the city. Mom opted to stay at home and watch the dogs. Notice dogs is plural. When we returned home after a few hours, the first thing I did was go and check on my babies, and found the dog–singular. Max had gone missing. I can’t even begin to explain how out of character this is for my little boy. Max is my velcro dog. Yes, I often can’t find him, but that’s because he’s directly behind me. But, Mom put the dogs in the backyard, went shopping, and when she came home, only Lulu was there. Max isn’t as smart as I think he should be–but that’s because I make an unfair comparison to my last black and white dog, who was at least half border collie. But he’s smart enough to know my parents house, and to know when we are here, that this is where he needs to stay. Well, thank goodness for small communities that still believe in raising children free range, because while I was crying, and searching, and crying, and making lost dog posters, and crying, and praying, Mom was gathering the neighborhood kids into a search party. And while they didn’t Max, a couple of the boys told their mom that they were looking for him. Well, the mom happened to see an employee of a local sandwich shop grab Max as he was trying to cross the highway, so she knew who had her. The mom was then able to get us into contact with Max’s rescuer, and I once again have two dogs. I know that I’m not going to have Max and Lulu forever. I know that they were five years old when they came to live with me, and they haven’t gotten any younger. I know that they are just dogs–if there is anything as just a dog. Right now, though, Max and Lulu are my reason for living. There are days that they are the only reason I get out of bed. I know that I need something else to hold on to, but right now, I’m glad that I just have something. And I’m so glad that Max is home. Growing up is so overrated. 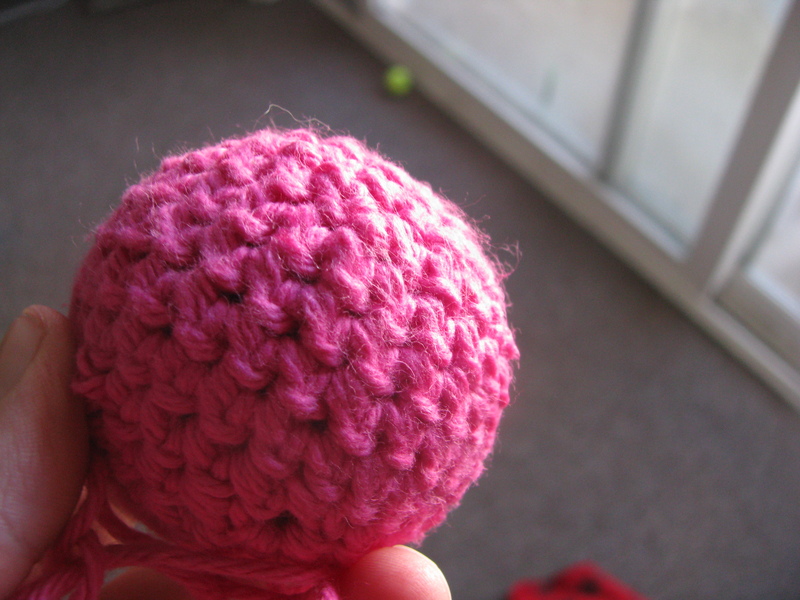 I figured something out: If you want to cheer up, you should do something that you enjoyed doing as a kid. Like building a fort. One of the things that sold me on my condo was these awesome shelves that a previous owner had installed in the bedroom–great storage for books without cluttering up the floor with an actual bookcase. 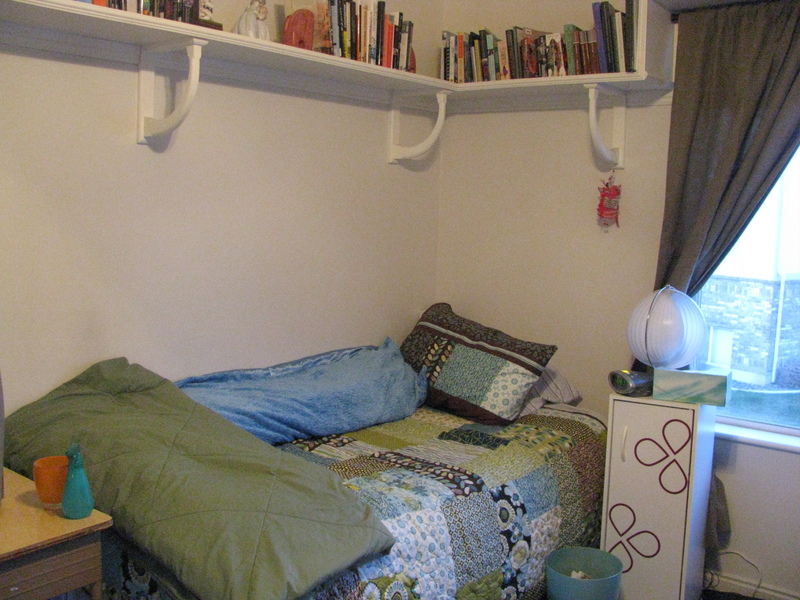 For most of the time that I’ve lived here, I’ve had my bed next to a wall with a short little shelf. 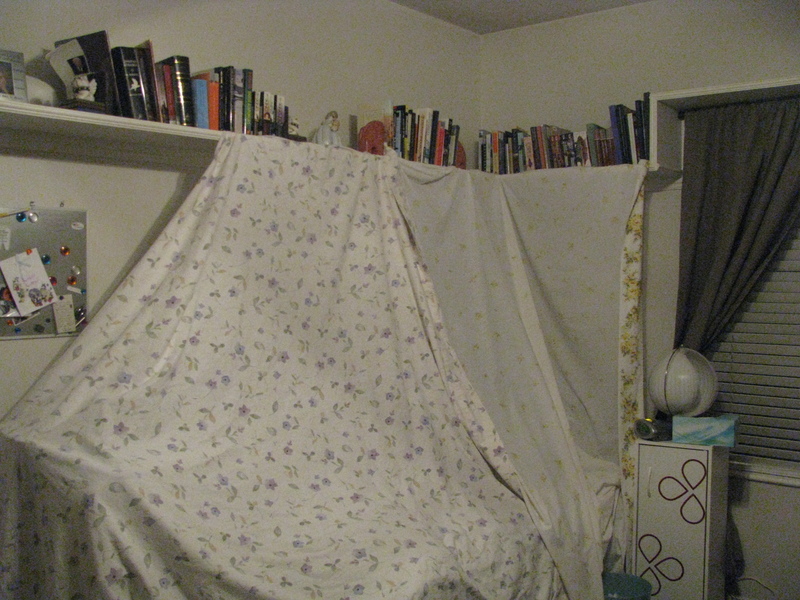 When I thought I was getting a desktop computer, I moved my bed to the wall under the long shelves, and ever since then, I’ve wanted to drape sheets off the shelves to make a fort. Here’s how my bed normally looks: Notice the beautiful quilt and pillowcase my mom made, and gave me for Christmas. And the totally awesome shelves. And my book collection. 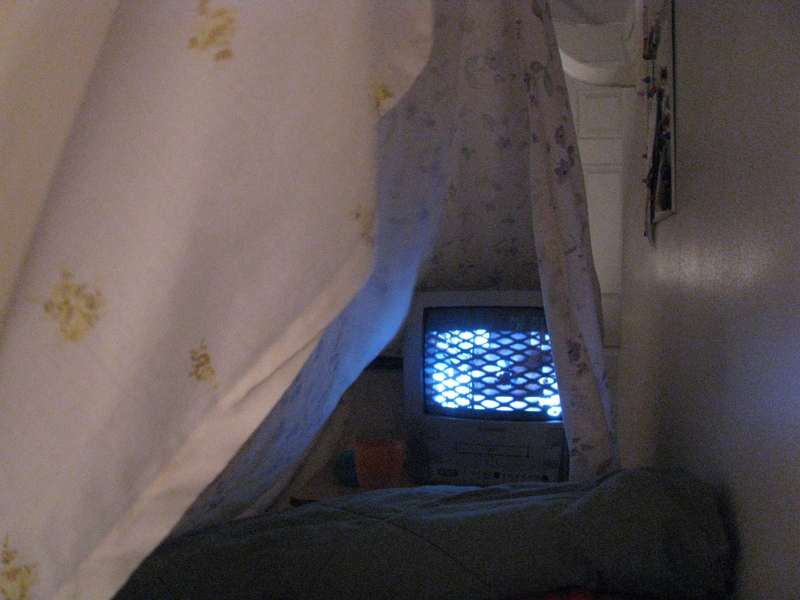 Doesn’t this call for a fort? 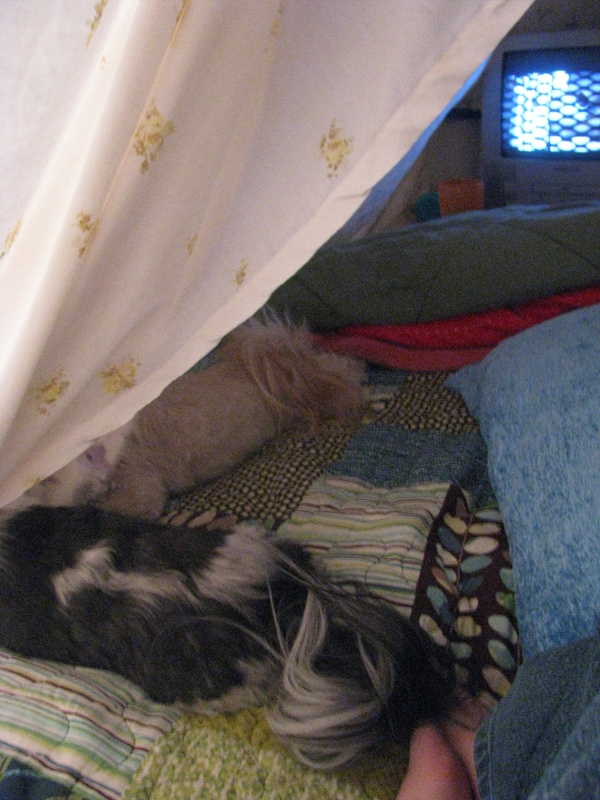 Okay, so it doesn’t look so great, BUT forts don’t have to look great, right? The part you can’t see: When Lulu can’t figure out how to get down, she starts playing with my toes. it’s those little things that make it special. Okay, I admit, I’m about 18 years past the point when people usually stop building forts out of blankets and sheets, but dangit, I haven’t stopped giggling since I started this little project. I’m going to have to do some experimenting, to make sure that books and bookends won’t come down if the sheets get tugged on too hard. If that works, I’m totally going to leave it up overnight. Because a confused shih tzu makes for an entertained Cori. And that’s all that matters, right? * NOTE: I love my dogs. I actually do try to make their lives easier. I don’t confuse them on purpose very often. 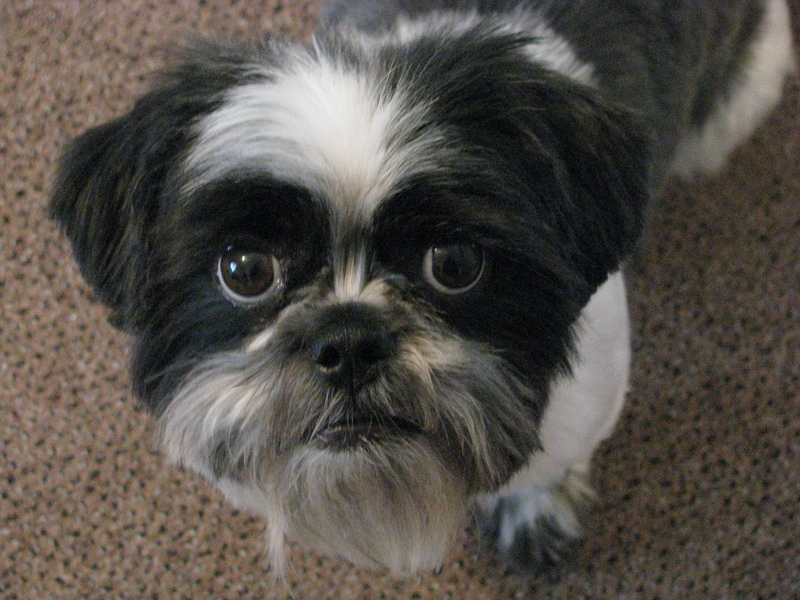 A confused shih tzu is entertaining, but a content shih tzu is a great cuddler, and I prefer the cuddles.